Joseph Kitaka, a resident of Yatta in Machakos County, Kenya, has always had an interest in defending human rights. His community is faced with numerous challenges, including gender-based violence, police brutality and many other human rights violations. Mr. Kitaka had little hope of utilising Information and Communication Technology (ICT) to advance his ambition in bettering his community, until he was elected the chairman of Yatta Paralegal Network, a local Human Rights Network (HURINET). Today, Yatta, is among 15 HURINETs in Kenya that are being supported by the Kenya Human Rights Commission (KHRC) to strengthen democratisation by widening civil society use of ICT to advance political accountability, freedom of expression and respect for human rights. The initiative is part of the ICT4Democracy in East Africa Network, a regional coalition of civil society organisations coordinated by the Collaboration on International ICT Policy for East and Southern Africa (CIPESA). The network maintains various ICT platforms and undertakes activities including research, capacity building, mentoring, advocacy and civic engagement toward strengthening democracy. The network’s partners use digital technologies to hold leaders accountable to citizens, fight corruption, enhance communication and the right to freedom of expression, as well as the right to seek, receive and impart information and respect for human rights. In Kenya, KHRC maintains an SMS short code and crowd mapping platform which enable citizen reporting of human rights violations, and building a vibrant social movement of citizens who monitor government performance toward a society free of human rights violations. 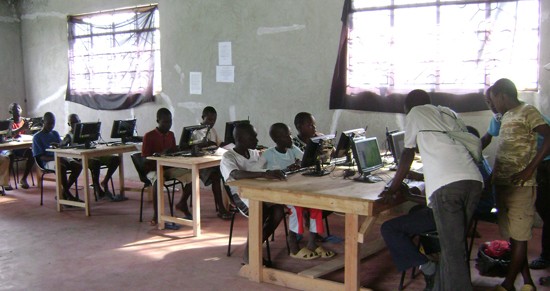 Through KHRC’s project, 10 HURINETs have received computers, modems, generators and digital cameras to support their work. Mr. Kitaka received a modem, a computer and a digital camera to enable the smooth operations of his network. He asserts that the equipment greatly eased information sharing among the networks and other human rights defenders. “Three years ago, sharing information was a challenge. It took very long for human rights defenders to share reports, it was also very expensive since we could only access ICT equipment in cyber cafes at a cost. With the equipment given to us by KHRC, everything is moving on well,” he said. Earlier in 2014, KHRC conducted two community outreaches in the Kibera and Kangemi informal settlements in the capital of Kenya where active audiences of 109 and 138 respectively were trained in the use of ICT platforms for promoting human rights and good governance. These engagements enabled hundreds of ordinary citizens to use web tools (such as SMS, Facebook, HakiReport, HakiZetu) to report on governance processes. Kenya has high rates of access to digital technology, with mobile access rates at 80% and internet access rates at 57%. However, most citizens do not have the skills to use simple technology tools in pursuance of good governance at a time the Kenyan government is making laws and regulations that limit freedom of expression. In a bid to enhance the quality of the content generated by the human rights networks, KHRC further trained human rights defenders on communications skills in February 2015. The training focused on news writing, multimedia use, interview skills, social media and use of the KHRC e-library as a research tool. The training was attended by 15 local human rights workers, who will collectively contribute to the newsletter Mizizi ya Haki (The Roots of Justice), which focuses on activities of human rights networks. “From the skills obtained from the communications training facilitated by KHRC, I have managed to train other human rights defenders on how to file good reports,” added Mr. Kitaka. The training evaluation indicated an overall change in the knowledge, skills and attitudes of all beneficiaries. Social media and article writing were indicated as the most useful training sessions toward the beneficiaries’ more effective human rights work. However, further training needs were also identified, including digital security, media laws and multi-media content generation. Participants also identified a need for training in proposal writing and resources mobilisation as well as in paralegal work. The work of KHRC and the ICT4Democracy Network is supported by Swedish International Development Cooperation Agency (Sida). Written by Catherine Kamatu and originally published on the CIPESA website.